January 26th is Australia Day, and there are certain traditions for the day – one of which is a big feast, usually Barbequed, and because it’s the perfect season for it – often as not it will be Lamb. This year a few weeks before I noticed these babies on sale … and I have an idea for how to cook them now so they’ll be ready for Australia Day. You know Tandoori Lamb makes sense. The other big tradition is the Australian Day One day Cricket match at the Sydney Cricket ground – this year it is between Australia and India. 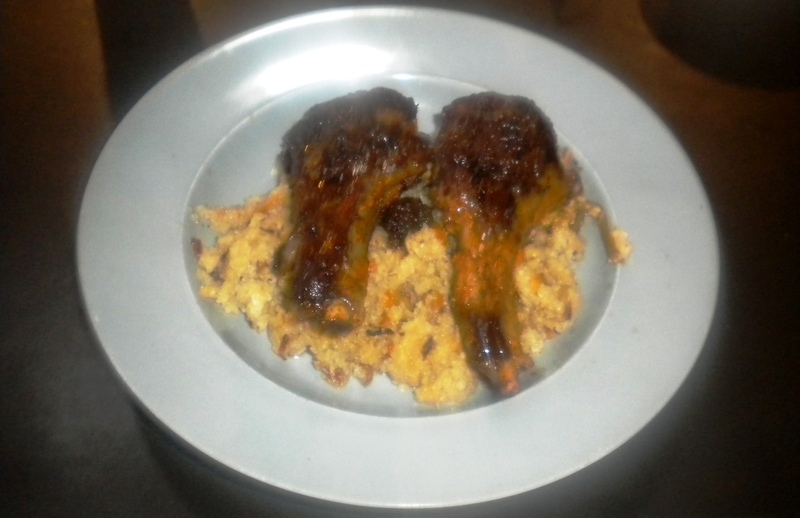 Apparently January 26th is also India’s National day so it’s twice the occasion so this year I’ve created a new meal – Tandoori Lamb cutlets cooked sous vide. It requires a little equipment, like a vacuum sealer and an electric water oven or Sous Vide machine, but these are becoming consumer items and you can pick up both for less than $200 if you shop online. Sous Vide is basically a bath of water held at a very accurate temperature for hours, sometimes days. You cook food in it by vacuum packing the food first in a plastic bag, along with any marinades/sauces – then holding it in the water until the food is perfectly cooked. Why would you want such a fancy device? Well the thing about cooking Sous Vide is that you can cook your meat to a very precise temperature for a very long time. Let’s talk some Physics. If you take a piece of Lamb muscle and warm it to 55°C it will be cooked a perfect Medium Rare. It doesn’t matter if it is at that temp for 10 minutes or 10 hours, it will remain perfectly Medium Rare (this is why restaurants use the process). If you want your meat to be Medium, the temp you need to get it to is 60°C, and if you want well done Lamb muscle, you should bring the meat to 70°C. 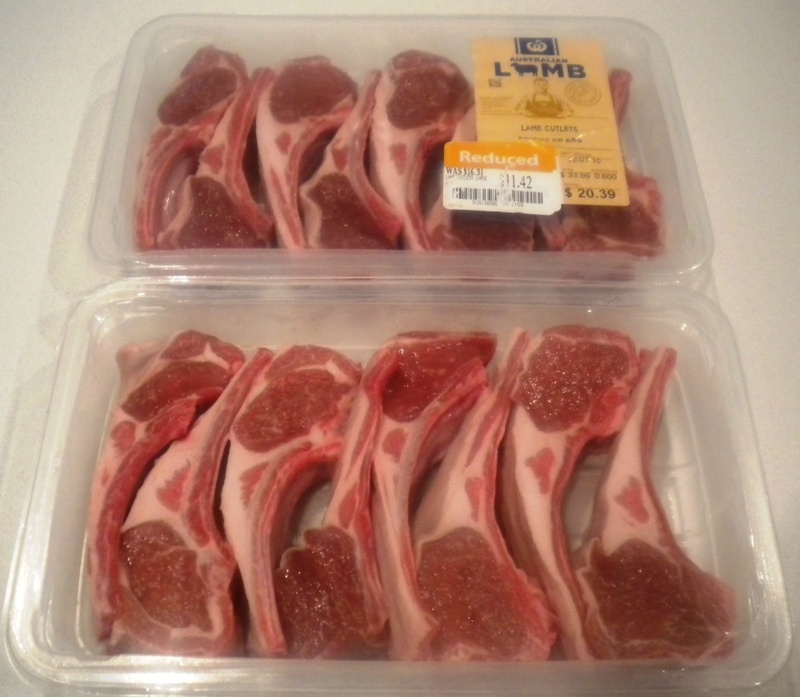 Now if you wanted to traditionally cook say a Lamb Chop on a Barbecue grill, that hot plate will likely be around 350°C. You don’t want to get the meat to THAT temp, it’d be leather. What you do is put it on the plate for only long enough for the center to warm up to the desired doneness temperature. It takes about an hour for that heat to penetrate half an inch of Muscle. As you probably know if you want a perfectly medium-rare Chop then you need to time your cooking precisely so that the meat in the Middle is at 55°C and no higher. But of course by then the meat closer to the outside might have already gotten to 60°C – it’s going to be Medium, not Medium-Rare. And the Meat further out may have gotten to 70°C (well done) so only half your chop is Medium-Rare. If you have just 10-15 minutes to cook your meat, then you have to do it like this but if you have more time then there is a much better way. If you cook your meat at only the temp you need it to eventually reach then all of the meat from edge to edge will be perfectly Medium-Rare. It takes about an hour for the temperature to move through a half inch thick muscle – so with a Sous Vide Machine to get Medium-Rare steak you cook it at 55°C for 2+ hours. If your meat is larger than an inch thick then you might need too cook it for 1-2 days. What we’re going to do is put the meat in a bag and remove all the air so there is no air pockets that might insulate the meat from the surface of the water. Sometimes you might just oil the meat with a little olive oil to give it’s own fats a head start for rendering. But for this recipe we’ll make up a Tandoori marinade mix using a little yogurt and commercial spice paste. You need much less Marinade when using a Vacuum. You could just throw all the cutlets into one bag, and run the Sous Vide for long enough for the desired temperature to reach the center of the bag (About 2 hours per Inch for lamb). But one meal will go straight to the table and the rest are going to be frozen. So we portion our meats into one meal containing 2 servings per bag, which in this case works out to be 4 cutlets per bag. We set the Sous Vide Temp for 58°C (Medium/Medium-Rare) and the time for at least 2 hours. In our case we prepared the bags in the morning and just ran the Sous Vide Machine all day, taking the “To be frozen” bags out after the first 2 hours and leaving the “To be eaten for Dinner” bags until dinner time. For the bags that are going to be frozen for later use, we have to quickly get their temperature down from 58°C which is too hot for bacteria to multiply, to under 4°C which is too cold for them to rapidly multiply – in other words from cooking temp to Fridge temp. This zone that pathogenic bacteria love to rapidly multiply is called the Danger Zone, and we want to bring the meal down as quickly as possible to minimize the colony forming units of pathogens. The best way I have found is to just drop them in a Bowl filled with ice water. Once the Bags are cool, you can take them down below 0°C in the freezer for long term storage, put them in the Fridge for short term use, or Warm them back up to serving temp and eat. When the bags have been in the Machine for over 2 hours the meat is all perfectly cooked and you can eat it just like that. However the surface of the meat will look pink like the inside of a Medium-rare steak which can be a bit off putting. 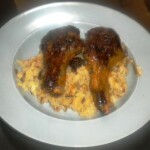 So we generally pan sear them in a hot Cast Iron pan for 1-2 minutes each side or until nicely caramelized. The total price was about $24 worth of meat, for 8 servings = which makes this a very cheap meal. 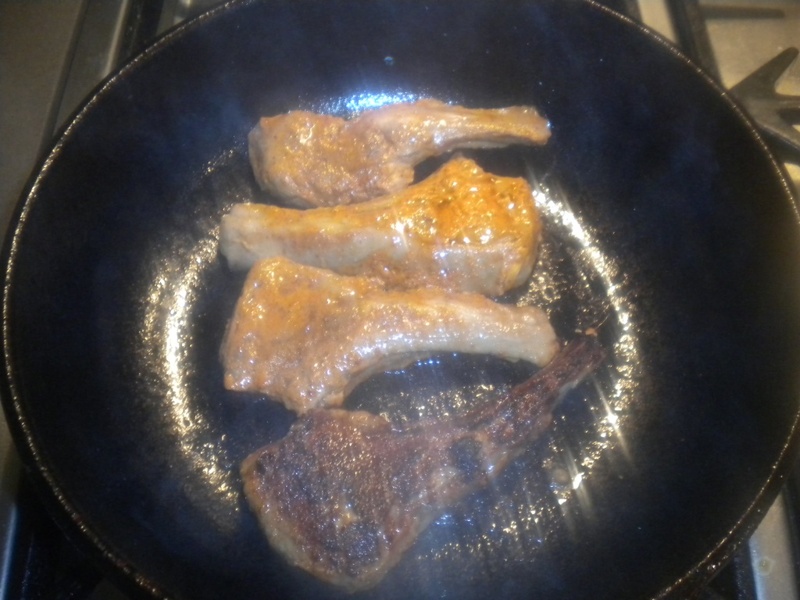 The end result was 4 absolutely flawlessly cooked cutlets for dinner, Easily the best Tandoori Lamb we have ever eaten, and 3 more dinners frozen in the freezer ready for next time we are in a mood for more. 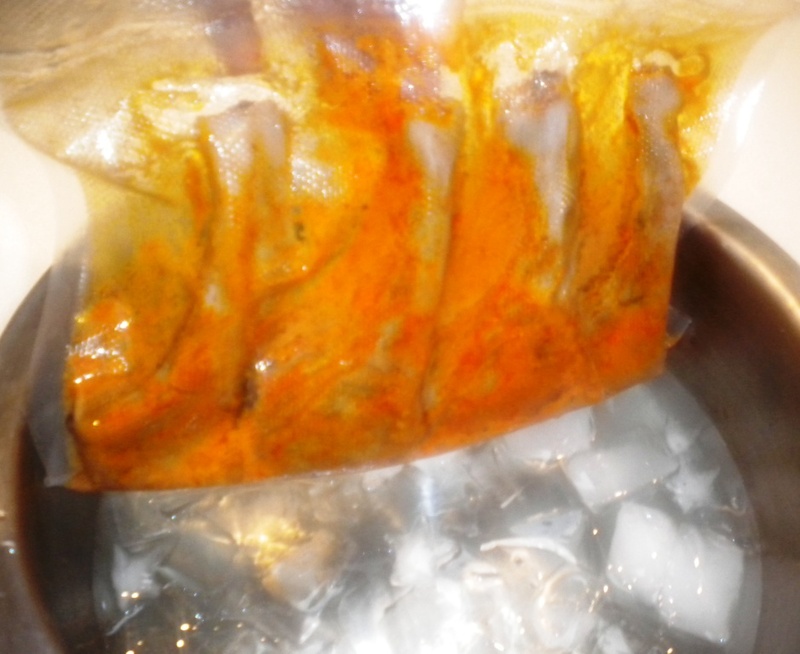 Create the marinade by mixing Tandoori Paste and Yogurt in a bowl. Dunk a cutlet into the marinade, and place into a vacuum bag. Repeat until you have 4 cutlets in the bag. Then remove the air in the bag and seal it. Note if your vacuum system has a liquid setting you should use that so as not to extract any of the marinade. Start on the next bag and repeat until all the cutlets are prepared in bags. Set the Sous Vide machine to your desired temperature. For lamb we like Medium/Medium-Rare and have found that 58°C gives a perfect result. You could cook at any temp from 55°C (Medium Rare) to 70°C (Well done). Set the Sous Vide machines cooking time to at least 2 hours - and put the prepared bags in the device and make sure they do not float on the surface of the water. We sometimes use a couple of 5lb weights from a dumbbell to weigh the bags done. Once the meat is cooked you can Freeze meals that you don't intend to eat immediately. 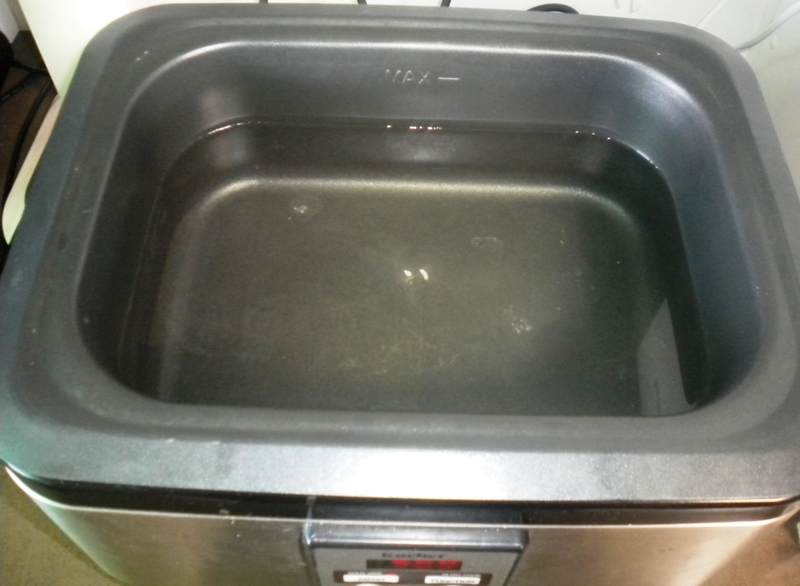 Drop the cooked bags into a bowl containing some Ice cubes and a little water. Keep the bowl topped up with Ice as cubes melt. It takes about 15 minutes for the temperature to drop sufficiently to put the bags in the freezer without melting adjacent items. 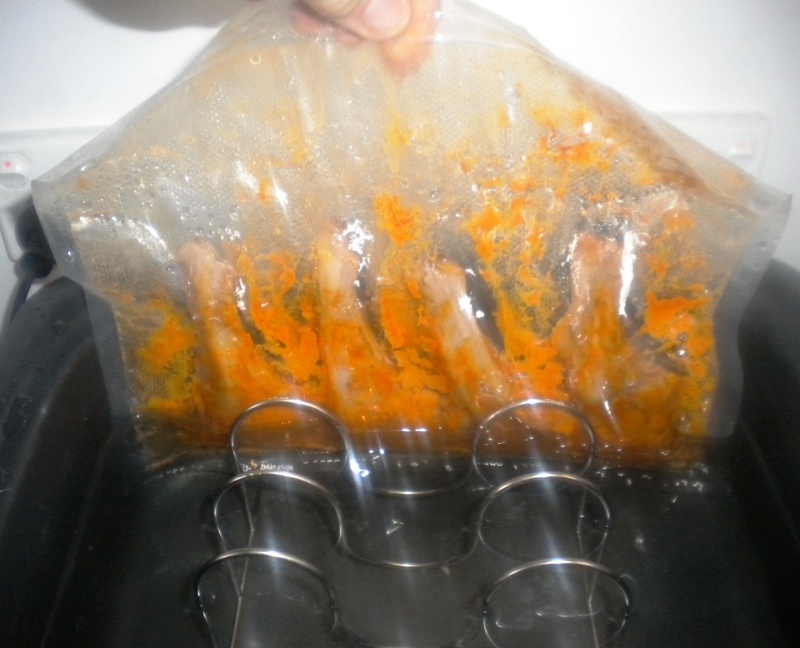 If you intend to serve a frozen bag, thaw it to room temperature in a bowl containing warm water. Get a Cast Iron pan hot, add about a teaspoon of lard, and fry both sides of the cutlets until the surface is just caramelized. Pour any bag juices in the pan and take it off the heat. I like to rest the cutlets vertically on their fat cap in the pan to render away any remaining solid fat. While the cutlets are resting prior to services, give them a regular baste with the pan juices to keep them moist.